Happy Monday. How's everyone doing today? The whole morning has been nothing but a blur for me, as I edited photos and blasted music. One of the things I've been planning on the side recently is starting something (Instagram or Facebook) dedicated to my planner obsession. It has been a giant help in getting organized with my blogging amongst other things. So do you think that's something any of you might have interest in? Enough about that though, let's talk polish ladies. For today, I have the newest collection from Daily Hues Lacquer. It doesn't have an official collection name so I've simply dubbed it the 'Crelly Craze'. You'll soon see why, haha. These five gorgeous crellies by Daily Hues Lacquer, along with the Valentine's Trio, will be releasing today. Not to mention. Jenn's also worked along side her favorite bloggers and swatchers to release an amazing collection. Needless to say, it's a huge polish release day for Daily Hues Lacquer and you guys will definitely not want to be left out. Tillie is a white crelly filled with dark purple micro glitters. One of my favorites from this collection, doesn't it remind you of like black cherry? It reminds me of grape soda so much I had to sniff it, haha. It's so jam-packed with glitters without seeming textured, which is important in a good crelly and glitter mix! Perfect formula and consistency, each layer applies very smoothly. For these swatches, I used two thin coats for an opaque finish and sealed it off with a glossy topcoat. Amelie is a white crelly base filled with gold micro glitters. Due to the color, the glitters blend in more with the base than the others in this collection. But you can see them in the macro-shot below and I believe perhaps a third layer would even it out a bit better. This is definitely the 'delicate' one from the bunch. I can see myself wearing this one for the office or whenever I want to have a low-key mani. For these swatches, I used two thin coats for an opaque finish and sealed it off with a glossy topcoat. Formula is great and applies evenly throughout. While it only needs two layers for an opaque finish, you'll probably want to add a third for more glitters. 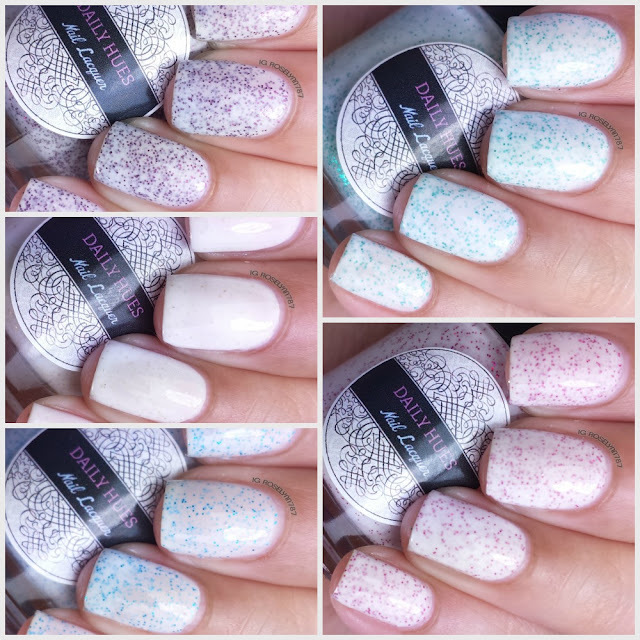 Julie is a white based crelly filled with teal micro glitters. 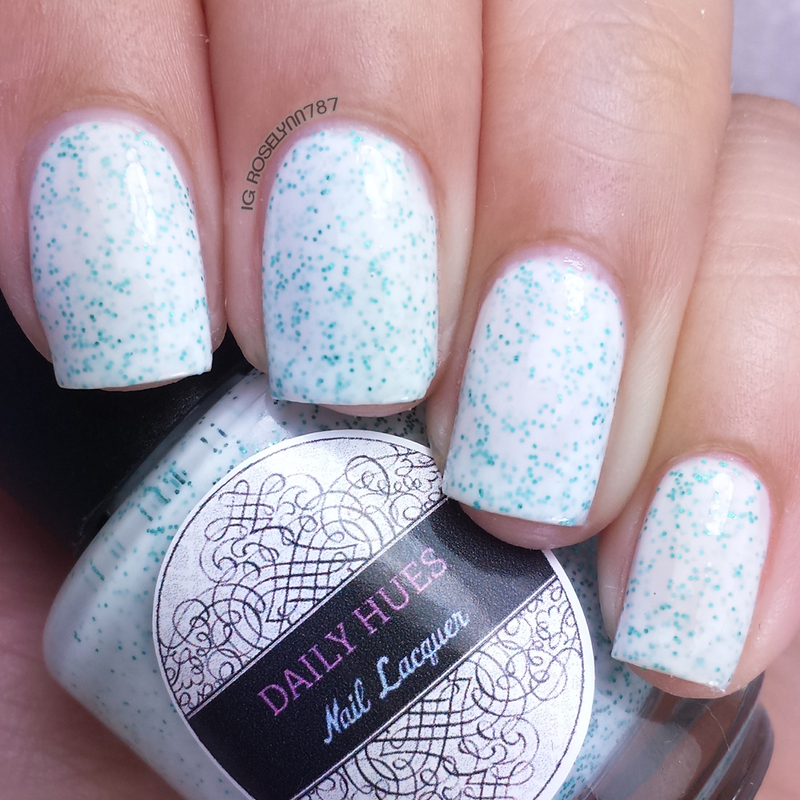 Combining both of my favorite things (white crelly base and teal), of course this one is my favorite hands down! This one is also jam-packed with glitters, making the brightness of the teal against the white really stunning. For these swatches, I used two thin coats for an opaque finish and sealed it off with a glossy topcoat. Again, perfect crelly formula and consistency. Each layer is not too thin nor too thick and evens out with just two coats. Because of the thin layers, these polishes end up drying very quickly as well. Callie is a white crelly with magenta micro glitters. Tell me you guys see what I do with this combo?! Strawberries and cream! I can myself using this particular one quite a bit during the spring time. It's girly and cute, without being too overbearing in color. For these swatches, I used two thin coats for an opaque finish and sealed it off with a glossy topcoat. Formula is exactly the same as the others and applies just as well. And finally we have Ellie, a white crelly filled with bright blue micro glitters. It feels wintry, but so vibrant and fun at the same time. It's no wonder I'm still rocking this one. For these swatches, I used two thin coats for an opaque finish and sealed it off with a glossy topcoat. As with the others, you'll find nothing wrong here. From sleek and easy layers, to a perfect consistency. It's an A+ crelly polish all around. Overall... I don't I need to really tell you how crazy I am about these five dream boats. You guys know how much I absolutely love white based crelly polishes. I've tried to keep the gushing to a minimum, but these really hit me hard. That being said, unless you're a crazy crelly lover such as me, you'll probably have a favorite based on glitter color. Either way, you can expect high quality formulas all around with fairly quick dry time. As I mentioned before, these five are releasing today so don't miss out any longer! Tell me guys, which one is your favorite? Or are you like me and just love them all? Ellie seriously made me think of Frozen haha. I'm still trying to decide how to go about sharing my planner stuff. I'll definitely post an update on here about it. These are to die for, and your photos are great too! Haven't tried out this brand yet, but I'll definitely be keeping an eye on them! Thank you so much. 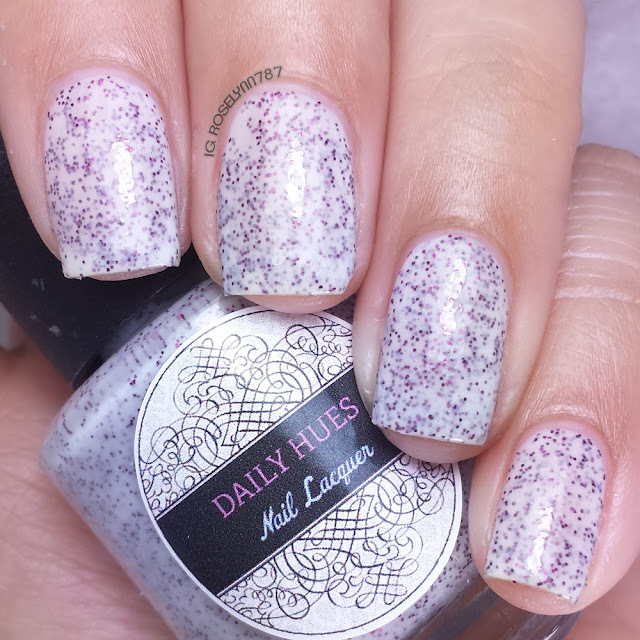 Daily Hues is one of my personal faves, she does a lot of finishes really well. Excellent post! I thoroughly enjoyed every word! Thanks. I can't pick between them, I love them all so much haha. White crellies aren't my thing but these are stunning! And yes I would be super interested in a planner post! I'm still searching for a planner and would love to read about yours! I'm over here like, "Those macros though!!!!!" Fabulous! I can see me loving Amelie for a lace stamped mani base, it's so delicate! Haha thank you!!! I'm always subconscious about my macro shots but these polishes are so stunning. I'm with you! Julie is my favorite as well but they are all super pretty! Thanks. I can't wait to do a nail art mani with Julie. Ah that's right! Like speckled eggs or something. Can't believe I didn't think of that. Wow!!! I love every single one of these polishes!! I do think the gold disappears a bit on the white. the glitter is so subtle and gorgeous! Right. Each one of them is so gorgeous in their own way. These are all really pretty!! I agree. And great bases for nail art too! Amelie is my favorite, even though the glitters sort of disappear. Yeah, it's a shame. I think the polish needed to have more glitters added like the others. These are so pretty! I'm a sucker for white crelly clitters! Glad to know I'm not the only one lol. Cute! I just picked up the Valentine's trio the other day. Ellie is definitely my favorite! Beautiful swatches! I absolutely adore Julie -- it is beautiful! These are all so pretty! My favorites are Julie and Amelie. I wish the gold glitters in Amelie where more visible but I can still see myself wearing it and using it as a lovely base for nail art.